I seem to have been a bit obsessed with plant portraits lately so I will address this over the weekend. Easter is, for many, when thoughts turn to the garden so a few practical tips seem appropriate. I will start with spuds. Despite the fall from prominence of the humble potato in the UK diet, as we eat more rice, pasta and couscous as our source of starch, we still eat a lot of spuds. And in Ireland potatoes are still a large part of the diet. I tend to prefer waxy spuds but, in general, it is floury potatoes that are most popular in Ireland. There is much fanfare when the first ‘British Queens’ appear for sale, usually in late May and early June, and stalls appear at the roadside proclaiming the first ‘Queens’, described as ‘balls of flour’. So this year I am aiming to beat the crop produced in the west of the country or those planted under plastic here in the sunny southeast. I am growing some in bags. These were planted just over a month ago and by keeping them in the greenhouse I hope to get a very early crop. Early varieties such as ‘British Queen’ should be ready to harvest in 10-12 weeks from planting. But you can grow any variety in this way and there is plenty of time to plant some if you haven’t yet. As usual, ‘chit’ the seed potatoes before planting, placing them in a cool, bright spot so they form short, purplish shoots. Although you can buy special bags for growing potatoes, I use old compost bags (60-80 litre size). Roll them down so they form ‘pots’ about 30cm high. Put a 15cm layer of multipurpose compost in the bottom, having first made a few slits with a knife. Place two seed potatoes on this and cover with about 15 cm of compost. Water and wait. Mine were planted about a month ago and last weekend the shoots started to appear. Today they were about 19cm high and on Monday, when they have grown to about 15cm, I will roll up the sides of the bag and add about 10cm of compost. This continues three or four times. As they grow give them plenty of water and a weekly liquid feed. By rolling up the bag and adding more compost you increase the length of the stems and, potentially, the yield. Potatoes are frost-tender and these bags will not be placed outside until mid May, just before they are ready to harvest I hope. 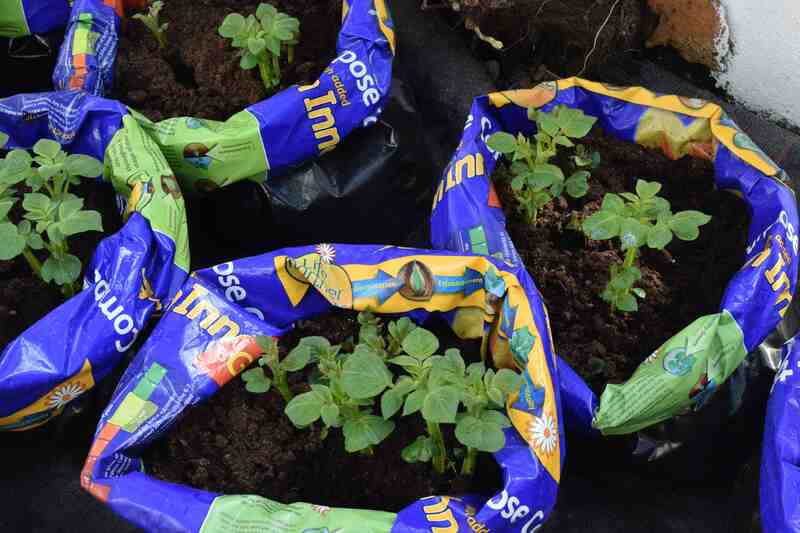 You can plant your potatoes now and start the bags in a greenhouse and put them out to continue growing. The potatoes are ready to harvest, or at least investigate, when the flowers start to open. 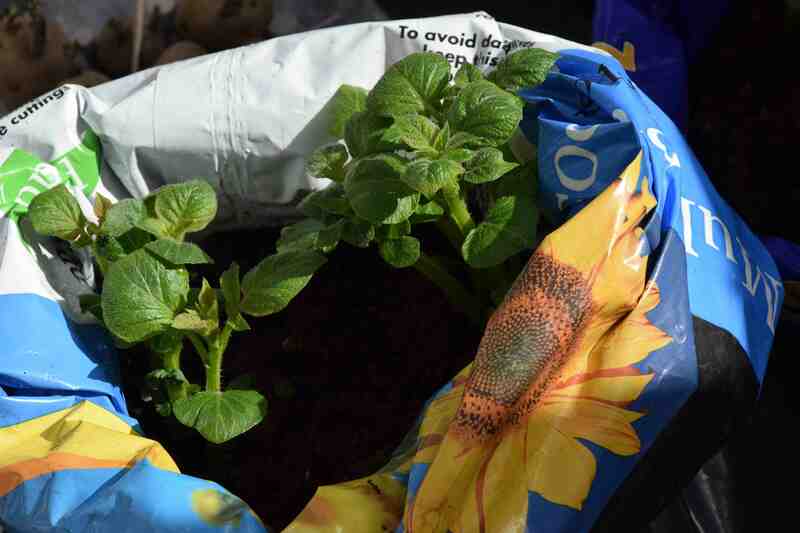 The advantage of this method of growing is that when you think the spuds may be ready you can put your hand down the side of the bag and harvest a few, allowing the rest to get bigger. This is better than digging up plants in the garden only to find they are not really ready. For the cook the advantage is that the potatoes are less likely to have slug holes and they are easy to clean. You can grow any type this way but early varieties are probably best because they have shorter haulms (tops) so look less scruffy than tall maincrops, especially the ‘Sarpo’ varieties which have huge haulms. ‘British Queen’ is a second early potato that was bred by Archibald Finley in Scotland and was introduced in 1894. It is good for boiling, baking and roasting and has white skin and flesh and a floury texture and good taste. Everyone here says that there favourite meal is a plate of ‘Queens’ – well that is a slight exaggeration but only slight. But there is a caveat. It is not just a plate of ‘Queens’ but it has to be heavily slathered with butter.